Perfect fit for Ovation mid bowl. It's the only case that is made for an Ovation. Made well, perfect fit, should provide many years of service and protection. I prefer the hardshell molded case because tolex covered cases tend to scuff and tear easily and, are usually heavier. If you own an Ovation guitar you owe it this case. Highly recommended. .This has a much lighter weight than my Stagg Hardshell Case, fits my Medium Bowl Ovation perfectly and offers adequate protection for everyday normal use. Holds my small tuner/capo/fast-fret wipe/set of strings & picks in compartment under neck. Also enough space under headstock for a 10ft. guitar cable. .I purchased this case to replace the original leather gig bag that came with my 1968 Balladeer 12 string. It was a little snug at the nut, but I've been assured by Ovation techs that it will adjust quickly. Otherwise, a good fit and good quality. .Ovation brand hardcase, looks like the real deal, and was described to fit "most" mid depth Ovation guitars, but in reality, my CE44 does not fit so well. I had to put some bubble wrap under the Lyrachord bowl to lift it up in the case, otherwise when you close the case, it put pressure down on the neck like a fulcrum and lifted the bowl up. Disappointing that I had to hack something together. .I received an Ovation 1778TX-5 as a birthday gift recently, and knew I needed to protect this amazing guitar. This case holds my 1778TX perfectly! If you own a comparable-sized Ovation, this case will be more than satisfactory. The case pocket inside is small, though still has enough room for small items (picks, strings). The four locks provide more than sufficient security. Overall, a great deal! .This case fits my 12 string nicely, it also has a compartment for extra stings, capo, picks or what ever small objects you may need to carry along. .Bought this 8158 Guitar case for an Ovation CC-24 Acoustic electric because, well, it's an Ovation case. Not very well made, I'm afraid. For the price, I'm very disappointed. I LOVE my guitar, but the case needs to be drop-kicked through the Goalposts of life due to poor manufacturing/quality control issues.Externally, the Top half lip is out of alignment with the lower half by 1/8" - I have to force the bottom half in to mate with the top in order to latch the case.Internally, the case pocket is rather small. The inside lining was not glued to the case very well, I still see the white glue around the edges on the top and bottom halves where the lining was supposed to be attached, and have used a round-tip knife blade to try to push the lining back down in-between the case side and internal foam.The Guitar sits noticeably crooked in the case due to the neck support being off-center. This places my Hi E side of the headstock 3/8" from one side, and my Lo E side 1 & 1/2" away from the other. Basically, the Tuning Keys on the Hi string side almost touch the inside of the case.I buy many things from M.F., just seem to have snagged a bad one with this case. I'm keeping it because it "fits" my guitar. .This case looks great and is light yet durable. Locking as well which i did not expect. The picture shows white lettering but mine was only black no white lettering at all. Still looks great and I like how light it is. The compartment is a little small on the inside but still a decent size. .Nice sturdy case to Protect your Ovation. 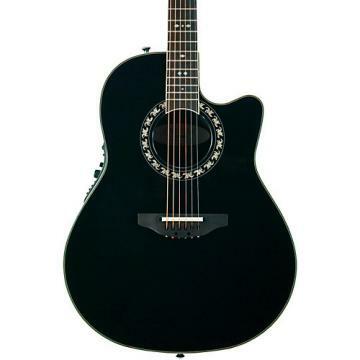 Many reviewers ask "Why doesn't Ovation include the with All Ovation?" The case IS included with all Made-in-the-USA Ovations. 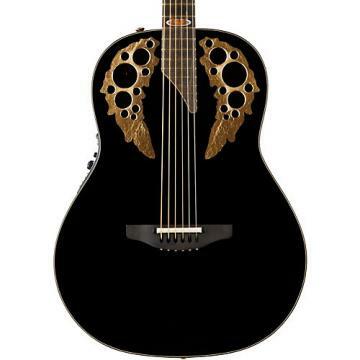 The question might be, "Why don't all of the Guitar Stores include a case with each Ovation?" Also, you can get a TKL case that will Fit an Ovation and a "wood-box" guitar if you so choose. But this case is made specifically for Ovations. If you have other guitars, get a different case. .I have both a twelve string Celebrity Deluxe and a 6 string Celebrity Deluxe. These are my second and third Ovation guitars. Through the years I have taken a couple spills while carrying my guitars. These cases have done a wonderful job protecting my instruments. In the last spill I took I slipped on the ice and threw my guitar about ten feet when I fell. The case was a little scratched up, but the guitar was unscathed. These cases are wonderful!